Photo: Raw parts for 47-String Starlight Concert Grand pedal harp produced in new carbon fiber fabrication facility. Our Heartland harp owners truly love their carbon fiber harps! Here at Heartland, our goal is to Refine the Harp Experience for all harpists–offering a variety of harp models that are lightweight, impermeable to the elements, virtually indestructible, and delight both player and audience with a rich and powerful resonant tone. In this effort, we continue to expand and improve our line of harp models, based on harpist’s needs and demands. We are currently working on redesigning the pedal box of our 47-string Starlight Concert Grand pedal harp. We are also close to production on the new Air Serenity lap harp, and we now offer our first Double Strung harp–the Double Strung Legend. Whether creating a new carbon fiber harp or redesigning one of our existing models, the process requires a great deal of research, development, and testing. The use of space age materials in the building of our harps also requires exacting production methods. In the development of any new or redesigned model, there is a lengthy series of precise steps. Each part is first created in a 3D virtual space. We continue to revise this design until we achieve the desired parameters. 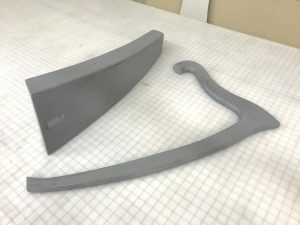 Once we have achieved a working design, the parts are patterned either by 3D printing or by the creation of a “plug” or “buck” (a master pattern for our molds). This process results in a working master that can be duplicated to create either new elements of an existing model or a entirely new model. The timeline for this process varies depending on the complexity of the design, and can take up to 12 months or more–from concept to production. When the new model is ready for production, each harp Heartland builds goes through 12 major production steps before it is ready to be shipped to its new owner. As we continue to expand our line of Heartland harps, we are expanding our production team to meet the increased production needs. Be on the lookout in the coming months for more about these new team members and their role in the harp-building process in our “Builder Bios” articles. Since our article in the November issue of Heartland Happening, we have begun producing each of the Starlight harp parts in our own carbon fiber fabrication facility. Research and development continues, as we work through the prototype phase of the pedal action redesign, with the use of 3D printed parts. These parts are also being fitted into a redesigned pedal box shell. Once the Starlight enhancements are complete, we will offer the world a carbon fiber Concert Grand pedal harp that requires less maintenance, and (when maintenance is necessary) is easier for owners and technicians to service. To the best of our knowledge, our Air Serenity lap harp will be the very first all-carbon fiber, celtic-style lap harp in the world. We are currently in the final prototype phase–creating the molds for the harp–and plan to go into production in February. We are currently taking pre-orders for this lap harp. All that is required add your order to our production list is a $500 deposit. Click here for more details about the Air Serenity lap harp. Master (buck) for prototype of our new Air Serenity carbon fiber lap harp. Our newest model in production is our first double strung harp–the Double Strung Legend. We are excited to bring the benefits of a carbon fiber harp together with the unique sound and enhanced playability of a double strung. As with each of our harps, this harp comes standard in Classic Black with the options of a painted and/or wood grain finish. The Double Strung Legend has now been added to our lineup of harps on our website Model page. Click here for more details about the Double Strung Legend. In response to the demands of harp therapists, the next model we plan to offer in a double strung version is our Air Serenity lap harp. Be on the lookout for more information on the advantages of double strung harps and our Double Strung Air Serenity lap harp in future articles. 36-String Double Strung Legend harp in Rosewood (tonewood) and Birdseye Maple (soundboard) wood grain finishes. 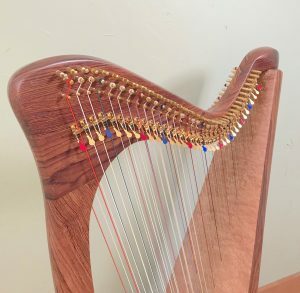 Now Taking Pre-Orders: New Air Serenity Lap Harp! Copyright © 2012 - 2018 Heartland Harps. All rights reserved.